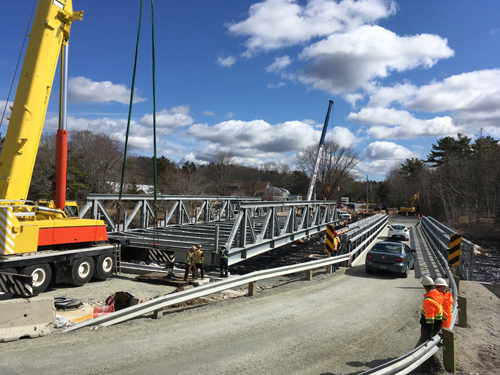 Acrow Bridge supplied the detour structure and is in a joint project with Canam-Bridges to supply the replacement truss bridge that is being built alongside for Nova Scotia Transportation & Infrastructure Renewal. The project will see replacement of two existing bridges which span the Roseway River near Shelburne. It was decided to build the single lane 'trail' bridge first and use it as a detour while the second bridge is being built, to reduce inconvenience for residents and tourists . The trail bridge is 42.7m long by 4.2m wide. After its use by vehicles and pedestrians as a detour, it will remain in place permanently to carry pedestrians, equestrians, mountain bikers, cross-country skiers and snowmobiles as part of the Shelburne County Rail Trail. 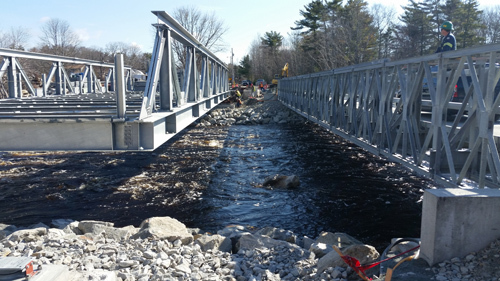 The galvanised truss bridge, which was designed, fabricated and installed by Canam-Bridges of Quebec, uses Acrow’s standard prefabricated orthotropic steel deck units which are fabricated to meet the quality standards of the AISC and ISO 9001 in Milton Pennsylvania. Due to the orthotropic design and through the use of robotic welding, they are not only very effective in terms of weight and strength, but very cost effective as well. The bridge is 42.7m long by 9m wide. Construction began approximately three months after the start of the trail bridge project in October 2016 and it is expected to be open to traffic by early June 2017. The design engineer is Greg Connors of NSTIR and the contractor is Dexter Construction of Bedford, Nova Scotia.